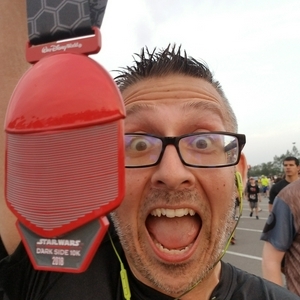 I’m Beej, and I’m a running-obsessed mega-geek from Alabama. Since 2010, I’ve lost over 150 pounds, and despite falling in love with fitness, I'm still the same Star Wars-loving geek I was. I just love running almost as much as I do Wookiees. I wasn’t bitten by a radioactive spider or exposed to cosmic rays. I couldn’t fit on a roller coaster, so I changed how I lived my life. Today I’m 155 pounds lighter, and World of Warcraft and Mountain Dew have given way to water bottles, tempo runs, and World of Warcraft. I don't have all the answers, but I'll share what I've learned. S1E12 - What You Need to Know about Anxiety and Self-Care - "You are not alone"
Season 1 of this podcast is a re-release of the first season of the original Geek Fitness Health Hacks podcast. When switching hosts, the episodes went off iTunes, and they need to exist again. I hope you get something out of them. It’s summertime, y’all, and you’re probably not drinking enough water. If your mouth is dry and you feel thirsty, it’s already too late--you’re on the way to dehydration. Even if you think you’re drinking enough, you’re probably not (we all overestimate how much we drink). So drink up, geeks! If you’re low energy, or hungry. It may not actually be hunger. You may not honestly be fatigued. Your body may be drying out like a husk. You don't wanna become a mummy! So grab yourself a filter bottle and carry it around everywhere you go! And if you're outside, running, cycling, or really, doing any kind of activity that makes you sweat, you're going to want to drink a cold bottle of water (or the equivalent) every 15 minutes. And even though it might be gross, you want to pay attention to your peepee. You want to pee clear. Or as clear as you can. If your peepee looks like a nice, cold glass of lemonade...great! Just be sure not to drink it. If you’re at that point, you should be drinking enough you’re not THAT thirsty, anyway. Season 1 of this podcast is a re-release of the first season of the original Geek Fitness Health Hacks podcast. When switching hosts, the episodes went off iTunes, and they need to exist again. I hope you get something out of them. Like that old dude in the cave said in The Legend of Zelda back on the NES, “It’s Dangerous to Go Alone.” And honestly, it kind of is. As you embark on your fitness quest, the most dangerous thing you can do is try to do this solo. Just like in a video game, if you try to take on the fitness dungeon alone, you're probably gonna wipe. So you need to look for people to party up with! Friends and family IRL want to help! They love you! People at the gym are there for the same reason! Talk to them! Check out Twitter! There are lots of cool hashtags with awesome people! (I'm biased toward #RunChat and #MeatlessMonday, personally). Reddit has some awesome subs like /r/yoga, /r/runninglifestyle, and even /r/loseit for weight loss. Also: Facebook! The awesome Geek Fitness page is there to help, and so are your family and friends! SOMETHING OF THE WEEK Linux! Ubuntu! My Windows PC crashed 4x this week. Winload.exe crashed a bunch. Between Win10 and Win8.1, I got mad and&nbsp;installed Linux. It's my first time. And it's awesome. Truly amazing. If you've ever been interested in it even a little, you totally should. You can even run Ubuntu straight off a USB drive with no installation. THE QUEST LOG I've been making excuses! I haven't been going to the gym! I am totally embarrassed to tell you folks that, so as soon as I finished recording this, I put pants on and went to the gym and did a full set of weights and rode the stationary bike for cardio. Thanks for existing, fitgeeks! Season 1 of this podcast is a re-release of the first season of the original Geek Fitness Health Hacks podcast. When switching hosts, the episodes went off iTunes, and they need to exist again. I hope you get something out of them. If you're a true newbie, you have to train your body to get used to moving before you start beating it up. You need to get yourself used to moving. If you take the time to adjust your lifestyle before you set out, you'll have a much better time. If you want lasting wellness, you have to actually change the way you live your life. And making sure your body is moving around more is the most fundamental change you can make. So I’ve put together a small (and totally non-inclusive) list of things you can do right this very second to make your life a little more active without it being something as drastic as taking an hour out of your day to go to the gym. Feel free to reach out to me! I’d love to hear from you! Season 1 of this podcast is a re-release of the first season of the original Geek Fitness Health Hacks podcast. When switching hosts, the episodes went off iTunes, and they need to exist again. I hope you get something out of them. Too often, the "health" part of mental health is disregarded. Wellness is not just about your physical health. If any one of us is out of shape physically, we often seek outside help for it. We go to the doctor, we hire a personal trainer, or we pop some ibuprofen or start eating more veggies. But when we are out of shape mentally, there’s such a disconnect about seeking help. What’s the difference in seeking out a counselor’s help for anxiety as opposed to a personal trainer’s help with obesity? Why not use an app to practice meditation just the same as you’d download one when you’re ready to start Couch-to-5K? It took me years to finally seek help for my anxiety, so I know how hard that can be. I want to share with you some of the strategies I've learned regarding self care that have made my life much happier and healthier. Feel free to reach out to me! I’d love to hear from you! Season 1 of this podcast is a re-release of the first season of the original Geek Fitness Health Hacks podcast. When switching hosts, the episodes went off iTunes, and they need to exist again. I hope you get something out of them. I used to weigh 310 pounds. I was unhealthy, pre-diabetic (at least), and completely sedentary. I hated moving, being sweaty, working hard at anything, sports, and pretty much anything that didn’t involve being inside and staring at a screen. Then, 6 months after I got married, I went on a delayed honeymoon to Disney World and was able to get into a soft-opening of The Wizarding World of Harry Potter. It was magical…until I could just barely fit into the Dueling Dragons harness, and the attendant sent me off to what I was sure to be my death. That moment changed my life. I couldn’t go through life carefree anymore. Being fat was actually going to hold me back. So something had to change. I began eating according to the low-glycemic index, which meant I avoided all sugar, starches, and had limited carbohydrates (complex over simple), tried phentermine (which is a miracle drug), and used the extra energy from those changes to begin cycling and running so that when I hit my goal weight, I would already be entrenched in a new lifestyle. And when my dad died in 2012 after 12 years of heart attacks and other cardiovascular issues? I used that grief and stress to motivate myself into living as long a life as I could. I recognized that losing weight and health were not the same thing, and I made sure that not only wasn’t going to be limited in the life I was able to have, I was also going literally live the life I was able to have. So I lost 155 pounds since that day in Orlando, and I learned more than a few things that keep me fit, active, healthy, and geeky. The most important lesson, though, is this: Diets don’t work. Lifestyle changes do. Feel free to reach out to me! I’d love to hear from you! S1E5 - Twice-baked, savory sweet potato recipe. Mmmm. Season 1 of this podcast is a re-release of the first season of the original Geek Fitness Health Hacks podcast. When switching hosts, the episodes went off iTunes, and they need to exist again. I hope you get something out of them. In our house, we eat a lot of sweet potatoes, and this is my favorite sweet potato recipe. It takes maybe 10-12 minutes, and it costs very little money (or effort!) When things are tight, this recipe helps my wife and me get some quick, cheap meals in. -First, wash a large sweet potato and poke holes across its entire surface with a fork (to vent steam). -Then microwave it for 7-10 minutes (until soft all the way through). -Remove from microwave and slit it length-wise. Scoop out the flesh of the potato into a bowl, leaving the skin as a shell (you’ll put the meat back in later.) -Mix the potato flesh with a sprinkle of cheese, crispy bacon (or bits), a splash of milk, pressed garlic (or garlic powder), and sliced/diced jalapeno peppers. Smash it all together and place back inside the potato skin. -Add cheese on top and microwave it again until warm all the way through and cheese is melted (1-2 minutes, depending on the size of the potato). -Remove from the microwave and top with whatever you want. Our staples are avocado, sour cream, and black beans. We have also used chili and barbecued chicken. Lots of times, we end up foregoing the milk and most of the cheese, too, and just smash up some sweet potatoes, add some peppers and spices and throw whatever leftovers we have into the mix as a topping. It’s really versatile, and when people try it, they’re amazed you can do stuff with sweet potatoes to make them savory instead of overly sweet. Even if you’re not a fan of sweet potatoes (and I wasn’t before this recipe), it’s worth giving a shot and trying. If you love it, you’re welcome. If not, then I’m terribly sorry. But at least you tried! Feel free to reach out to me! I’d love to hear from you! Trailer - Good runs. Heavy lifts. Many friends. Much geek.